THBC series electronic load cell kits are ideal for weighing tanks, hoppers, mixers, and conveyors. 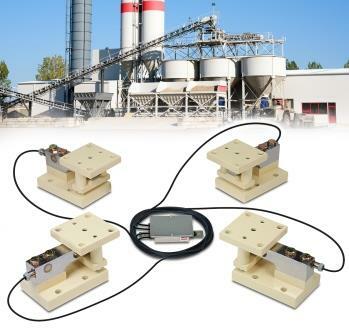 These self-checking load cell kits are available with mild steel or stainless steel stands, system capacities ranging from 7500 to 200,000 lb, and stainless steel waterproof load cells. The THBC kits are ideal for medium-to-heavy capacity tank and hopper weighing, new or existing installations, and accommodate multi-legged tanks with up to 10 legs. The THBC series offers an easy-to-install, low-profile, bolt-down design. Each kit comes complete with 3 or 4 stainless steel load cells, self-checking load cell stands, load cell cable, and a stainless steel junction box. Special self-centering load buttons protect against offset side loads. The rugged, environmentally-sealed SB series shear beam load cells are NTEP, OIML, and VCAP certified.